BISMARCK, N.D. (Gov. Burgums’s Office Dec. 5, 2018) – Gov. Doug Burgum Wednesday released his 2019-2021 Executive Budget, presenting the 66th Legislative Assembly with a plan that creates structural balance, improves transparency and replenishes reserves without any tax increases. Burgum noted the budget makes significant investments in infrastructure, education, behavioral health, team member compensation, legacy projects and other priorities while ensuring state government lives within its means. Burgum began the budgeting process in April by announcing a new approach: holding 57 strategy review sessions with agencies and institutions to find efficiencies, reinvent processes and encourage greater collaboration. He asked agencies to submit base budget requests with reductions of 5 percent or 10 percent depending on agency size, and to reduce FTE levels by 5 percent. The strategy review process identified more than $107 million in general fund savings, and $101 million was strategically prioritized for new and ongoing initiatives. Savings were found even after a 2017 legislative session that reduced the general fund budget by an unprecedented $1.7 billion, from $6 billion to $4.3 billion. The result is a general fund budget with $4.6 billion in ongoing expenditures, plus approximately $300 million in one-time spending from Legacy Fund earnings, for a total of $4.9 billion. More than two-thirds of the increase in ongoing spending, or $239 million, can be attributed to increases in the cost-to-continue formula payments and services in education, health and human services, which result from North Dakota’s growing population. The remainder of the increase is dedicated primarily to salary and benefit increases for North Dakota team members after they received no salary increases this biennium. “We need to fund our priorities in a responsible way that does not exceed our ongoing revenues. We have done that in this budget, without raising taxes,” Burgum said, noting the proposed general fund budget is still more than $1 billion below the 2015-17 level. The budgeting process removed more than 100 full-time positions, allowing many to be reallocated in priority areas, for a net decrease of 16 FTEs in state agencies. The Executive Budget proposes $14.3 billion in overall revenues and expenditures. This includes $4.6 billion in ongoing general fund revenue and expenditures, $300 million of Legacy Fund earnings, $3.7 billion in federal funds and $5.6 billion in special funds. To create a buffer against volatile commodity prices, the budget moves $315 million from the oil tax-supported Strategic Investment and Improvements Fund (SIIF) into the Budget Stabilization Fund, which was drained last session. With the SIIF transfer and an expected influx of $312 million in excess general fund revenues at the end of the current biennium, the Budget Stabilization Fund would grow to its highest level ever, providing a significant safety net. The proposed budget directs $265 million from the SIIF to the pension fund to help address its current $1 billion unfunded liability and ensure that it can continue to cover its obligations to retired team members. By taking this action and adopting corresponding policies recommended by an interim committee, the pension will be fully funded in only 18 years. The budget provides more transparency in how the state uses oil tax revenue to fund ongoing expenses. In past budgets, oil-derived revenue has been transferred into the general fund without fully recognizing its source. Bypassing these transfers will provide a clearer picture. The budget proposes placing $1 billion in oil tax revenue directly into the general fund to support expenditures. This amount represents 20 percent of general fund revenues – a lower percentage than in the 2015-17 biennium, when nearly $1.2 billion in oil revenue was used – and represents no more than 22 percent of anticipated oil revenues in the upcoming biennium. To address North Dakota’s behavioral health crisis, the budget proposes an additional $19.1 million in spending across the continuum of care, including help to eliminate gaps in access and improve the quality of crisis response services. Additional funding is proposed to expand the promising Free Through Recovery program and provide community-based supports for housing, employment, education and peer support. The governor’s budget delivers on the framework set by the Legislature for redesigning social and human services to better serve citizens, while also sustaining the permanent property tax relief it provides. The recommended budget funds county social services at a level of $182 million, up $22 million from the current biennium, with the increase going toward improving access to child and family services, particularly in behavioral health. To better support tribal social services, the budget proposes $2.9 million of general funds to expand access to support for caregivers of children in the care of tribal social services. The budget calls for $35 million from Legacy Fund earnings to replace the aging State Hospital in Jamestown and eventually repurpose it as a minimum-custody correctional facility for men, which in turn would allow the state to relocate women’s prison services from New England to the Missouri River Correctional Center south of Bismarck. Together, these changes will allow for consolidation of facilities and more efficient operations that will provide long-term savings of at least $7 million per biennium. Education and workforce go hand in hand as today’s students are prepared for tomorrow’s economy. Forty-six percent of the governor’s general fund budget goes to K-12 education and higher education, underscoring the state’s commitment to its students. At the K-12 level, the proposed budget increases the per-student payments by 2 percent each year, from $9,646 to $9,839 for the 2019-20 school year and $10,036 for the 2020-21 school year, while beginning to transition, over the next five years, the roughly half of our districts that are not yet on the funding formula. School aid spending increases in the budget by $115.5 million and does so more sustainably, with $103.5 million coming from the general fund. School aid spending from the Foundation Aid Stabilization Fund would be reduced by $62.2 million. For higher education and research, the budget recommends an increase of approximately $90 million to support increased staff compensation, Challenge Fund investment, targeted capital projects, and applied research. That includes $40 million from Legacy Fund earnings for the North Dakota Higher Education Challenge Fund, which has a 2-to-1 match with private dollars and will enable a total influx of $120 million into the higher education system. $30 million in competitive grants for career academies, requiring a 1-to-1 match from the private sector or political subdivisions. According to the North Dakota Workforce Survey, over 70 percent of available jobs in North Dakota require an associate degree or less. Career academies can help move youth into the workforce and lower the cost of college. $2 million for workforce development initiatives, including $950,000 to refocus the Operation Intern program to support local businesses throughout the state and $750,000 to address the nursing shortage by providing matching grant funds for rural health facilities seeking to add rural health care education in their local communities. $250,000 for grants to support giving students early exposure to North Dakota careers. $3 million for marketing to address the talent attraction and retention challenges throughout the state by promoting the state’s high quality of life. Recognizing the important role infrastructure plays in sustaining rural areas and supporting healthy, vibrant communities, the governor’s budget proposes $1.5 billion in critical infrastructure investments, including $815 million for roads, $464 million for essential water projects and $22 million for airport infrastructure. The total also includes $174 million for technology investments, the critical infrastructure of the 21st century. These 24 projects will improve public safety, citizen-to-government interactions and voting integrity. The budget recommends aligning 145 FTEs from 17 cabinet agencies into one shared IT service, addressing the risk of having over 400 organizations that touch the statewide network being separately responsible for their own cybersecurity. The budget calls for incremental investment of $16.4 million to centralize the state’s approach to cybersecurity and better guard against approximately 5.6 million cyberattacks each month. The budget authorizes 15,673 FTEs, including higher education, and increases compensation and benefits by $180 million, to $3.2 billion, to attract and retain the talent state government needs to deliver the services North Dakotans expect. The recommended compensation increase also authorizes performance-based raises. Salary budgets are increased by 4 percent for the first year of the biennium and an additional 2 percent for the second year. Agencies that can identify long-term salary savings equal to 2 percent will be authorized to provide an additional 2 percent for salary increases in the second year, bringing the total authorized salary increase to 4 percent each year. For health insurance, the state will cover the full 12.7 percent increase in premiums at a cost of $59 million, after covering the full $45 million increase for the current biennium. New health insurance options also are proposed for team members. Option 1 continues the existing main plan with no changes to deductibles or coinsurance, which will require an employee contribution of $28 per month. Option 2 is a new fully state-paid health insurance plan that, as a non-grandfathered plan, offers expanded benefits with a higher deductible but not premium cost to team members. Option 3 is the existing high-deductible plan with new incentives for participation. $30 million to build a statewide infrastructure network for unmanned aircraft systems (UAS) flying beyond visual line of sight. This will ensure that North Dakota remains America’s proving ground for UAS while also supporting commercial operations such as automated farming. $55 million for an infrastructure revolving loan fund that political subdivisions can use to fund important improvements and new projects that promote smart, efficient infrastructure, plus $25 million in additional investment in the school construction revolving loan fund. Together, these investments can be leveraged to drive $535 million in construction. $50 million for a Theodore Roosevelt Presidential Library and Museum, leveraging a 2-to-1 private investment match and partnering with the National Park Service. 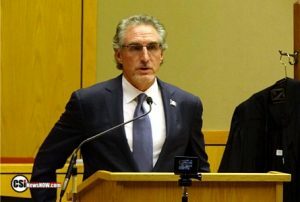 “As a state-of-the-art tourist and educational center that will serve as an economic driver for the state, the library will honor a man whose character, beliefs and drive were shaped by the land and people of North Dakota,” Burgum said.